This is a delicious and simple way to cook chicken on the barbecue. Ask your butcher to spatchcock your chicken for you - basically this is where the entire chicken is opened out for ease of cooking. Lay the chicken out flat on a chopping board. In a small mixing bowl combine the curry powder, olive oil, chilli powder, chopped garlic and lime zest. Mix well and then spread this mixture over the entire chicken. Transfer the chicken to a large bowl and allow to marinate for at least 1 hour, but ideally longer if time allows. Place the chicken, skin side down on a pre-heated barbecue. Cook for 7-10 minutes each side on the hottest part of the barbecue and then transfer to the outer side where it can cook over a more gentle heat for a further 30-40 minutes. Cover the barbecue with a lid during this time. If the chicken is a little big or the barbecue too hot, I like to transfer the chicken to the oven, or place it on a baking tray on the barbecue and cover with a lid. Cooking time will depend largely on your barbecue. 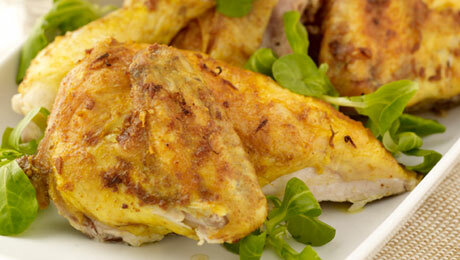 Ensure that the chicken is fully cooked – juices should run clear and the flesh should come away easily from the bone. Strain the rice into a large colander and leave it under running water until the rice has completely cooled down. Mix together the chilli powder, lime juice and the olive oil. Add the tomato, carrot and green pepper to the rice, pour in the flavoured oil and mix well.